Kager with a bevy of his powerhouse creations from the Sundown line. Around his home of Kingwood Township, New Jersey, Dennis Kager was known as “the corn man,” because he loved feeding the deer that would gather in his backyard. But throughout the rest of the planet, he was known as a world-class amp builder, modder, and innovator. Kager’s most famous design was the Sundown amplifier, and he had recently announced plans to re-enter the business. But he died at his home on Tuesday, August 14, at age 75. 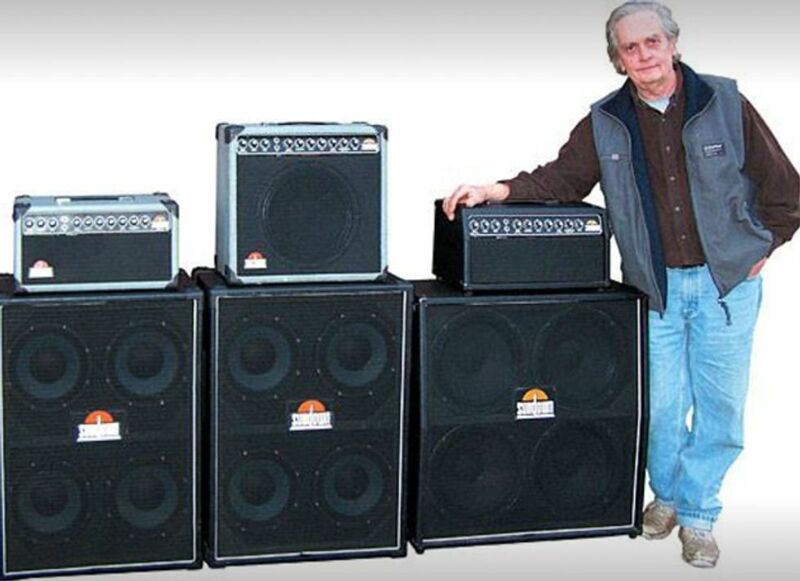 Kager was a graduate of electronics school and a gigging guitarist when he was hired at Ampeg in 1964 and began experimenting with their products. His first patent, in 1966, was for the Ampeg Horizontal Bass, and soon he was promoted to head of the company’s service department. At the same time, he was doing repairs for regional musicians out of the basement of his New Jersey home, including hit-makers like the Four Seasons. By 1973, he had left Ampeg and established a standalone business called Dennis Electronics in Union City, a mile from Manhattan, and landed contracts as the regional warranty center for Fender and Gibson. During the ’70s and ’80s, his client list expanded to include S.I.R., Foreigner, Hall & Oates, Rick Derringer, Johnny Winter, the Police, and the Allman Brothers. For the latter, Kager devised mods to make their Marshall heads more reliable, installing durable tubes and blowout lights in the back of the heads to indicate failures faster. In more recent years, Springsteen was a client. It was the first amp design with discreet channel switching and a biasing circuit that allowed the combo to be adjusted from 100 watts down to 15 watts by turning a dial. Eventually, Kager decided to make an amp to satisfy the versatile demands of working musicians, and in 1984 his Sundown line debuted—after a year of testing by Peter Frampton and other high-profile players. It was the first amp design with discreet channel switching and a biasing circuit that allowed the amp to be adjusted from 100 watts down to 15 watts by turning a dial. His first 1x12 combo was built to be small enough to fit in the back seat of a VW Beetle and still, as Kager put it, “blow somebody’s face off.” John Scofield and Allan Holdsworth were among his early endorsees. After taking a break, he set up a shop at Lou Rose Music Center in Edison, New Jersey, which eventually moved to Central Jersey Music Service, also in Edison. But he wasn’t quite through with amp design. He created new amp circuits for Gorilla, Yamaha, and Pignose in subsequent years. And until his death he also pursued his passion for animals and the outdoors, including his hobbies of hunting and fishing.